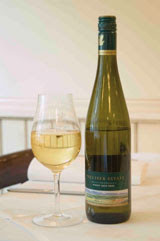 Palliser Estate is located in the Martinbrough wine region in New Zealand and their Pinot Gris 2006 is a delight to drink. With a lovely Golden Hue, it has Peach and Honey to the nose and is quite sweet to taste although not in a gluggy way. These flavours also come through on the palette with a hint of pineapple. It has a lot of complexity, has a lovely freshness to it, with a nice long length. It is a very smooth and nicely balanced wine.